What’s this? Color? On a Thursday? I’m sensing a pattern here. Sadly, this comic is one that may never see print. My editor said it was “too much of an endorsement for the paper” and that they could not run it. Which I can understand because yeah, if you read it then you’ll see that it certainly does come off that way. Self-promotion was actually not my intent though. I was just calling it like I saw it. There’s a chance that they’ll still run it if I end the newspaper version at the second panel, but we’ll see. The saddest part is that it is based on a 100% true story. This whole conversation really did take place. 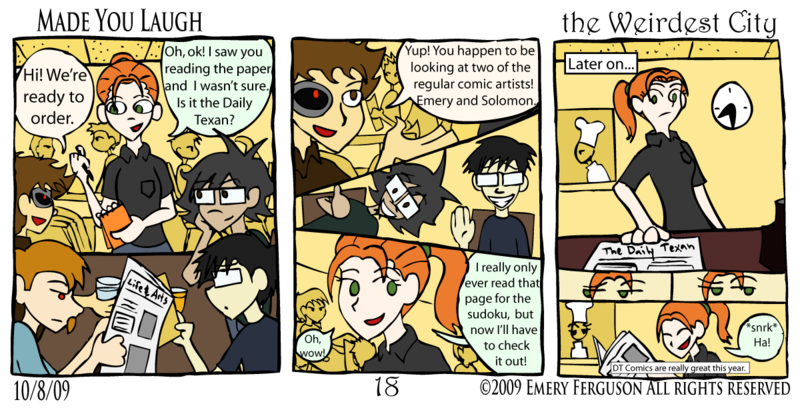 It was a while back when the first of our comic strips ran in the paper and we were newer to the game. The waitress, her name was Rebecca, was having a slow night and struck up a conversation about the paper. Jonathan shamelessly promoted us because Jonathan is the type to do such things when he cares about them. I think we made a fan that night. And maybe I’m a little biased but even if Smoothie Home and tWC were not in the paper, I’d still laugh more on average after reading the comics page than I have in any of my previous years as a student here. I hope you all do too.